Rian Johnson wasn't afraid to try new things with Star Wars: The Last Jedi, but one of his choices is so unconventional that some movie theaters are warning fans ahead of time. The scene is one that Star Wars VFX supervisor Ben Morris called the first of its kind in the franchise. 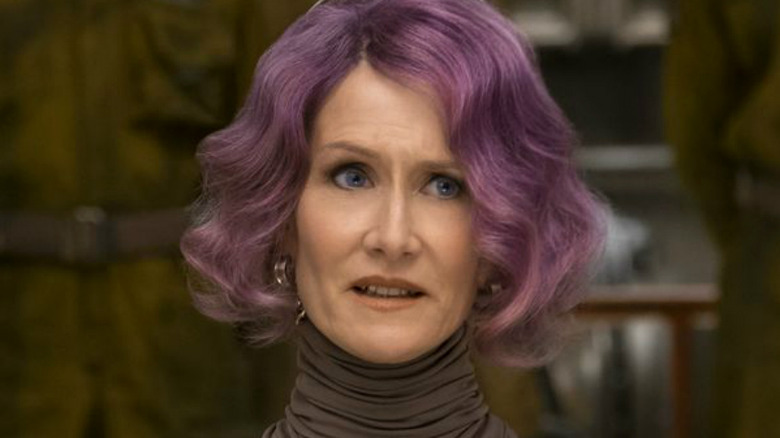 It happens about 112 minutes into the movie when Vice Admiral Amilyn Holdo (Laura Dern) sacrifices herself to save the Resistance by crashing her ship at light-speed directly into a First Order destroyer in order to release the escape pods. At the moment of the collision, Johnson decided to remove all sound for about 10 seconds. Morris told Collider it was an especially effective moment. "We had always hoped that would resonate, both as a story beat and as a striking visual, and when I heard all of the cries and gasps in the silence, it was just fantastic," he said. "We realized that it worked. That's never really happened in Star Wars before." However, it's a little jarring to some viewers, which prompted some AMC theaters to post a warning that the silence is an intentional choice and not a technical glitch. "Please note: The Last Jedi contains a sequence at approximately 1 hour and 52 minutes into the movie in which ALL sound stops for about 10 full seconds," reads an AMC note to moviegoers. "While the images continue to play on the screen you will hear nothing. This is intentionally done by the director for a creative effect." Of course, you can understand some of the cause for concern. There was almost a riot on opening night when one AMC theater had actual sound problems throughout the beginning of the movie.